Epilepsy in cats is very disconcerting for pet owners. There are three recognized types of cat seizures, namely, petit mal, grand mal and status epilepticus. Petit mal seizures symptoms like limb twitching and blank stare are so mild in nature that might not even be noticed at first by pet owners. Grand mal seizure symptoms, on the other hand, are more vividly displayed. You cat might fall over with body shaking uncontrollably, and may even urinate or defecate. Status epilepticus seizures symptoms are pretty similar to grand mal’s, however, they last longer than 5 minutes and can continue for hours at a time resulting in death. This type of seizure requires prompt medical attention. It is possible for your pet to experience cat seizures while sleeping or awake. There is no cure for feline epilepsy but there are medications available that can help control seizures. You can help your veterinarian manage epilepsy in cats by keeping a journal of seizures. 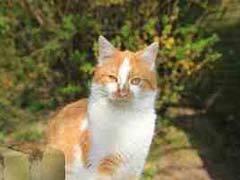 A video recording of the seizure is helpful in making the diagnosis of epilepsy in cats. Since epilepsy in cats is a chronic, or long term, medical condition you may want to consider cat health insurance to defray medical expenses. Epilepsy in cats is not the only cause of seizures. Blood sugar levels that are either too high or too low can cause seizures. Brain tumors, infections, liver disease or kidney disease can also be culprits. If your cat has anemia, has problems breathing or has heart disease, there may not be enough oxygen going to the brain resulting in seizures. Chocolate, antifreeze and lead are toxins that cause seizures in cats. High fevers from infection may result in seizures, as can overheating, for example, leaving your pet in a closed car in summer. Seizures can also be the result of not enough blood flowing to the brain or an injury to the brain. Before making a diagnosis of epilepsy in cats your veterinarian will have to rule out all of these other possible causes.